We’re giving you the green light to celebrate St. Patrick’s Day this March 17! We know you’ve commemorated this holiday in the past, but have you ever learned about why it exists? Today’s your lucky day, because we’re about to tell you. (We’re trying to fit as many St. Patty’s puns in here as possible. Can you tell?) St. Patrick’s Day is both a cultural and religious celebration. It falls on the date of the death of St. Patrick, who was a patron saint of Ireland. In the early 17th century, it was even made an official Christian feast! But now, people celebrate it all kinds of ways — from drinking green beer to wearing green clothing. Grab your beer (if you’re of legal drinking age) and let’s celebrate! FULL RANKING: HOW DO YOU PLAN TO CELEBRATE ST. PATRICK’S DAY? 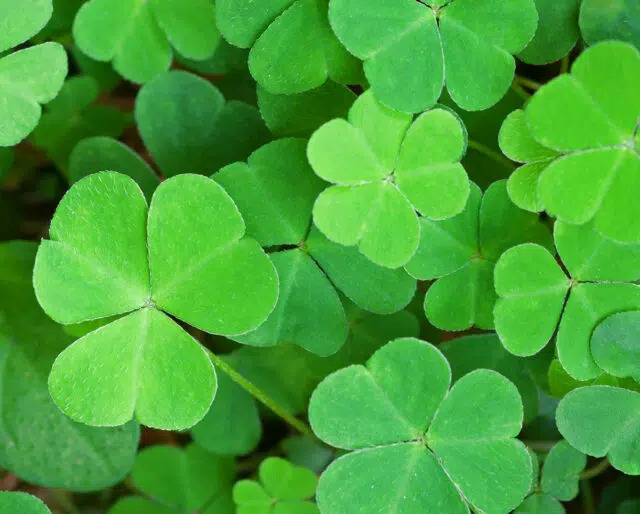 Four leaf clovers are extremely rare — but tradition says that, if you find one, you’ll experience amazing luck. Since St. Patrick’s Day is all about luck, you might want to try your hand at it this March 17! It’s still probably easier than winning the lottery. This is the easiest and most fun way to celebrate St. Patty’s Day. Pull out the one green item of clothing you own and go to town! And we don’t want you to wimp out; putting a green scrunchie on your wrist doesn’t count. Remember those days in elementary school where people would pinch you for not wearing green? Channel the spirit of those kids and go all out. We’re talking green pants, green shirt, green everything. Okay, we know this seems weird, but it’s a real St. Patty’s tradition. Take some friends to your local bar and try it together! It’ll taste just like normal beer, but be uniquely-holiday themed. Another option is to make your own — get some beer and experiment until you get that classic green hue. St. Patrick’s Day is a holiday that everyone loves to celebrate! There’s a parade in every major city (the largest and oldest one is in New York). And who doesn’t love parades? It’s the perfect opportunity to socialize with the neighborhood while marching around looking important. Get happy and gear up for your city’s parade! Look around you — when’s the last time you saw someone wearing green for no reason? Even if green isn’t anybody’s “best” color, it still deserves some love! We know you have that one green shirt in the back of your closet that you’ve always been looking for an excuse to wear, and St. Patrick’s Day is it. Since St. Patrick’s Day is at the end of March, it’s so close to the beginning of spring. The cold is receding and everything is starting to grow again. It seems like there’s green all around … and that’s not even counting the St. Patrick’s Day apparel people are wearing. It’s a perfect time to go out and enjoy the newfound warmth.